It’s easy to forget how important windows and doors are—that is until they’re no longer functioning properly. Whether it’s a simple crack in a window or a door that keeps jamming, door and window problems can not only be annoying, but they can also jeopardize the safety and security of your home or business. When problems arise, it is important to have a repairman you can count on, particularly someone who specializes in repairing and replacing windows and doors. Do you have the number of a professional and trustworthy glass and door repairman in the Fort Worth, Texas area? No? 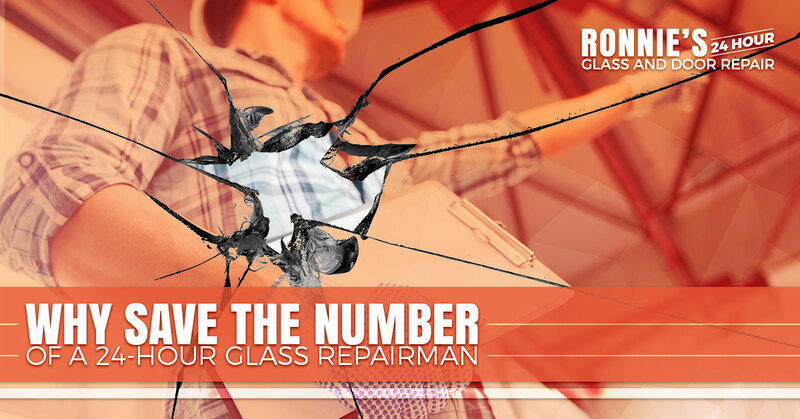 Well, what do you know, we have the number for Ronnies 24-Hour Glass and Door Repair right here: 817-349-7835. Curious what makes us so confident that we are the right repairman for you? Read on to learn about some of our services. One beautiful thing about doors and windows—in addition to providing protection and functionality—is the fact that many windows and doors are custom made. While this may pose a problem to some glass and door repair companies, we appreciate this and enjoy working on custom doors and windows and on custom projects. Contact us today to get a free quote for your custom project. As we mentioned, when a window breaks or a door won’t close or lock properly, this threatens the security of your home. When this happens in a business or commercial space, this effect can be even more pronounced. This is what some may people call an emergency problem. Emergencies can occur at any time, night or day, and they necessitate a super speedy repair. When this happens, it is important to have the number of a 24-hour glass repair service. This is something we take great pride in. We are available 24-hours a day, 7 days a week for residential and commercial glass repair and door repair. And while we have a keen understanding of the importance of getting a commercial window repair job done quickly, we never sacrifice quality for speed. Learn more about us, our services, and call us today to get your free quote!